The heavens rejoiced in a special way on Guadete Sunday, December 14, 2014, upon receiving Sister Camilla Kennedy in their midst shortly before nine o’clock that morning. She died in Maryknoll Sisters Home Care IV in the presence of several Maryknoll Sisters, who, along with members of her family, had been keeping vigil with her. Camilla was 88 years of age and had celebrated her 70th anniversary as a Maryknoll Sister earlier in the year. Born on June 20, 1926 in Syracuse, New York, Camilla was baptized Mary Therese Kennedy. 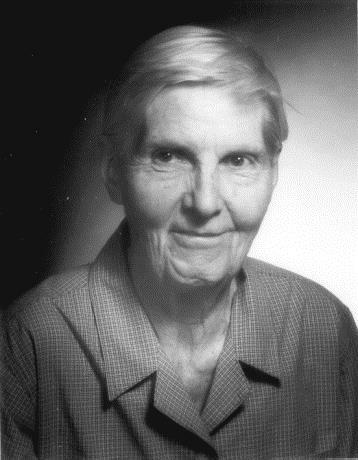 She was the oldest of seven children born to Matthew P. Kennedy and Irene Des Champs Kennedy; they included three brothers, James, Joseph and Laurence who became Syracuse diocesan priests, a brother Daniel who became a Dominican priest, her sister, Rita, who became a Sister of St. Joseph, and her youngest sister, Helen, who became Mrs. Ralph Lorenzini and mother to Camilla’s beloved nieces, Ann Lorenzini and Mary Lorenzini Dunham, and grandnephews, Peter, Timothy and Joseph. Camilla entered Maryknoll from St. Patrick’s Parish on Tipperary Hill in Syracuse where she had done primary and secondary studies in its parochial school. She graduated from high school in June 1944 and entered Maryknoll on September 6 that same year. At her Reception she received the name Sister Mary Camilla, the name she happily retained for the rest of her life She made First Profession of Vows at Maryknoll, NY, on March 7, 1947, and her Final Profession three years later, on March 7, 1950, also at Maryknoll, New York. From 1946 she studied at Maryknoll Teachers College, receiving a Bachelors degree in Education in 1950, the year she was assigned to the Hawaii Region. She was one of three Sisters opening a new mission in Likiep in the Marshall Islands. Camilla’s letters from this early period can stand proudly among the testimonies of great women of the different eras of our Maryknoll history! In 1964 Camilla was recalled to the U.S. to take up positions in the formation of Sister candidates, first as Assistant Novice Mistress in Valley Park, Missouri and then as Director of Orientation at the new formation house in St. Louis, Missouri. Sisters who went through formation in those years still refer to themselves as “Camilla’s girls.” Camilla also pursued post-graduate studies at this time, achieving a Masters degree in theology from Marquette University in 1971 and a Doctorate of Philosophy with a Major in Historical Theology in 1980 from St. Louis University. Her doctoral thesis, which deals with the spirit and charism of Mother Mary Joseph, was later published under the title: To the Uttermost Parts of the Earth. The book is Camilla’s legacy to the Maryknoll Sisters and for others a clear foundational reference document. Camilla returned to the Maryknoll Center in 1976, remaining part of the St. Louis Orientation Program staff and at the same time completing her doctoral work. At the Center she gradually accepted various positions, including Center Coordinator from 1977 to 1979, and member of the Center Council from 1979 to 1982. She worked in the Personnel Department as Director of Renewal and Education from 1982 to 1993. She was the Congregation’s Due Process Moderator for eight years, and delegate to several General Assemblies. She and another Sister worked tirelessly to bring to a close the 20-year post-Vatican II process of re-writing the Maryknoll Sisters Constitutions achieving Rome’s approval in 1990. She served as Coordinator of Mission Research and Planning from 1994 through 1999 and was Consultant for Canon Law for the Congregation from 1999 to 2004. Given her knowledge and experience, she was a member of the joint Core Committee that led to the formal founding of the Maryknoll Lay Missioners as an independent Maryknoll entity in 1994. For many years she partnered with Maryknoll Fr. Bill McCarthy to teach Maryknoll history to seminarians, lay missioners, and Sister Candidates. Winding down her active years at the Center, Camilla dedicated herself to creating a data base in which she catalogued all Mother Mary Joseph’s writings, letters and other holdings in the Maryknoll Mission Archives. This data base remains as another legacy, providing researchers with easy access to primary source materials. When Camilla’s health became worse, she chose to move to Residential Care in February 2012 and in October of that year she officially became a member of the Eden Community. She chose Likiep in the Marshall Islands as her prayer ministry, bringing her back full circle to her first mission. Camilla will be remembered as having had her own quiet way of treading lightly on this earth, moving about the Center on her own schedule, performing numerous routine services and touching the lives of all. She was loved as a free and freeing soul. Treasured quotes from her abound, far too many to try to recount. Camilla carried her special spirit to life on the fourth floor where the nurses and aides who cared for her became her newest community. She was not only appreciative of them, she loved them and they loved her. She seldom, if ever, complained. When she suffered a fall on the evening of December 5 and was taken to Phelps Hospital, she kept telling the Sisters accompanying her, “Let’s go, I’m ready!” However, she needed hospital care until December 10, when she was brought home on hospice care. Her deep spirituality, formed in the Islands and solidified in her studies, her community life and her love for Mother Mary Joseph had prepared her well. She indeed was ready to go home! We are happy to have Sister Camilla’s brother, Fr. James Kennedy, preside at the liturgy of Christian burial this morning. We welcome him, her sister Helen and her husband Ralph Lorenzini, her nieces Ann and Mary and her husband Michael Dunham. Her brother Fr. Laurence Kennedy was unable to be here today. We also welcome Camilla’s special friends, Mary Logan, Mary Brummagen, Peg Healey, Sue Pope, Sam Stanton, MKLM, and all others present with us this morning.